"Service is our life, we must always try to serve. 'I do not know who is Krishna, who is Bhagavan, I do not know what is what, but Guru and Vaishnava they know and they are always serving their Lord properly.' With this mentality we can help ourselves. I can help myself by always serving the Vaishnavas and my Gurudev. This is the proper channel. "If somebody is giving some money to the Math, they may think that they are helping this Math but actually they are helping their own self by their energy. Money comes through the exertion of energy. A man is trying to gain money and in so many ways he may be giving his energy for the collection of money, and when that money is given to the Math then that means that his energy is now coming to serve Guru and Vaishnava." Fill in the form below: please write your devotional name and the country you are from so that His Divine Grace could be notified properly. 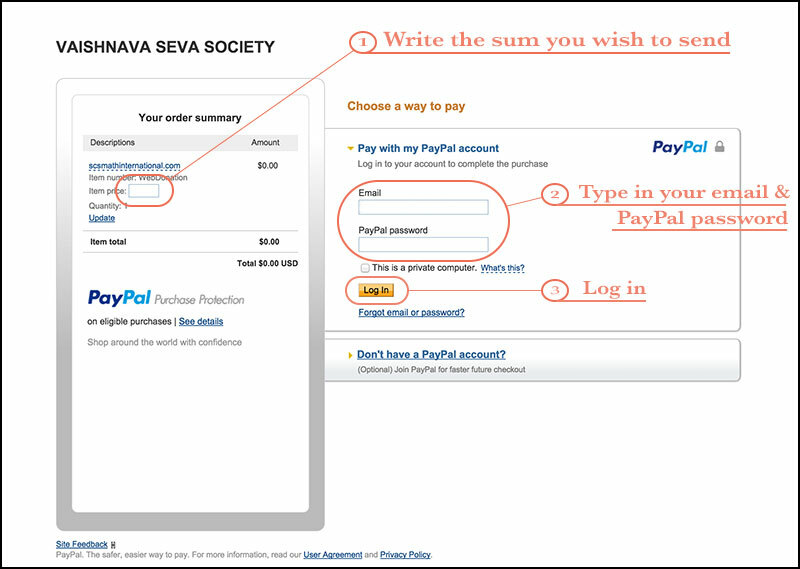 Click "Donate with PayPal": this will transfer you to the PayPal checkout page. The donation sum: on the PayPal checkout page, on the left side, there is a field "Item price"—please specify the sum you would like to send to the Math. Please note: the currency is the US dollars. Your donation is sent and you will get a confirmation email from the Math shortly.